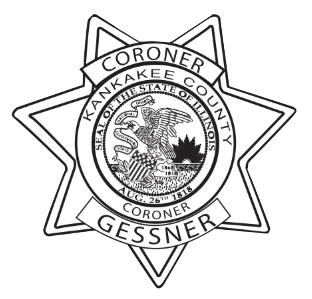 Copies of postmortem reports can be obtained through the Kankakee County Coroner's Office. Please provide a written statement which includes the decedent’s name, date of death, and your relationship or please fill out the FOIA form. Either can be mailed to: Kankakee County Coroner, 3000 S. Justice Way, Kankakee, IL 60901 or e-mailed to coroner@k3county.net. Please include your return address along with a phone number where you can be reached. Once the file has been completed, you will be notified of the charges. Please allow 3-5 business days for processing. Release of photos will be at the the discretion of the Kankakee County Coroner, photos can only be released to the legal next of kin. If you are not the legal next of kin, please have the legal next of kin fill out the Release of Privacy Interest Form. NOTE: Acceptable methods of payment are: credit card, cashier’s check or money order. Please be advised there is a $3.00 transaction fee for all credit cards. Certified copies of death certificates can be obtained by contacting your funeral home or the Kankakee County Clerks Office Vital Records Department.